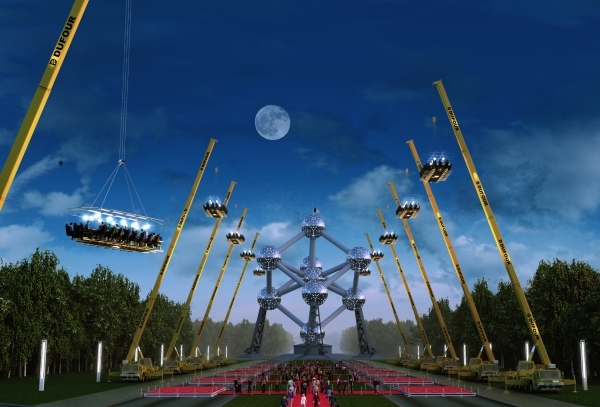 Dinner in the Sky celebrated their 10th anniversary by creating the world’s biggest open-air restaurant in Belgium. Dinner in the Sky was brought to life by Hakuna Matata, a communications agency that specialized in connoisseur delicacies, and the Fun Group, which had expertise in developing amusement park installations using cranes. They joined hands ten years ago to create one of the most innovative dining concepts of modern times and named it Dinner in the Sky. To celebrate their 10th year milestone, from 1st to 5th June Founders Stefan Kerkhofs and David Ghysels set up the biggest open air restaurant in the world in Brussels, Belgium. Set against the stunning backdrop of the Atomium, 4,500 guests dined in this restaurant set-up at a height of 50 metres. Dinner in the Sky’s 5-day celebrations included 10 Michelin Star chefs who put their heart into preparing the best recipes to satisfy the diners. Almost 140 people worked each day to make this event possible. There were three services on each of the five days. Each service involved 10 cranes that hoisted the Dinner in the Sky platforms carrying some 220 guests into the air while some sweet melodies played in the background to keep them entertained. After an hour and a half of indulgent feasting, guests descended from the clouds and back to the red-carpeted ground. Since its inception in 2006, Dinner in the Sky has surprised and delighted everyone who has had the chance to experience it. It has gained some extraordinary reputation amongst foodies from all around the world over the last decade. Dinner in the Sky is expected to reach around 56 countries in 2016. Some of the major locations include The Strip in Las Vegas, Sydney Bay, The Medina in Marrakesh and other surreal places. Tagged Experiences, Food & Drinks, LifeSpice, The Good Life. Bookmark the permalink.